When it comes to helping patients keep their smiles whole and healthy for life, the starting point for any dental practitioner will be prevention. 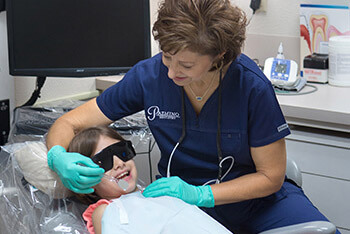 Keeping patients’ smiles whole and healthy for a lifetime is our top priority at Pazmino Dentistry. That all starts with regular dental checkups twice a year at our Temple, TX dentistry practice. These regular appointments allow our team to partner with patients to prevent the majority of oral health concerns and diagnose and treat others in their earliest stages. Contact us to find out more or schedule an appointment. Dental checkups are an essential component of any oral health care plan. In years past, patients only visited the dentist when they experienced dental pain or damage. This reactionary care lead to devastating effects on oral health. Many patients we treat still believe that tooth loss and dentures are an inevitability, but with proper preventive care, more patients than ever before are able to keep their natural teeth for a lifetime. During six month checkups, the dentist uses advanced diagnostic tools like digital x-rays and DIAGNOdent laser cavity detection and visual examination to screen for a number of common oral health concerns including tooth decay, gum disease, bruxism (teeth grinding and clenching), temporomandibular joint (TMJ) dysfunction, and oral cancer. Then, we carefully clean teeth removing plaque and tartar buildup from even the hardest to reach areas. Finally, we take time to sit down face to face with patients, explain our findings, and make recommendations for ongoing care. For kids who are still learning to care for their smiles and adults who are prone to decay, dental sealants offer a fast, painless way to protect smiles from tooth decay for up to ten years. The process is simple. During any regular checkup, our dentists apply a thin coat of clear, plastic dental sealant to teeth. This sealant seeps into the dips and cracks in the biting surfaces of teeth and is hardened into place. Once this process is complete, bacteria is entirely sealed out protecting the tooth. Many patients who don’t smoke think that they will not have oral cancer, but while tobacco usage significantly increases a patient’s risk for oral cancer, it is not the only cause. Many patients who are diagnosed with oral cancer do not engage in any of the associated high risk behaviors. Oral cancer is one of the deadliest forms of cancer in the US claiming approximately one life every hour, and of those diagnosed this year, less than 50% will live longer than five years. With startling statistics like these, it’s no surprise that the Oral Cancer Foundation has invested time in researching ways to decrease the number of annual deaths that occur as a result of oral cancer. Their research suggests that early diagnosis is the key to reducing the number of oral cancer related deaths each year. For these reasons, we include a thorough screening for oral cancer as part of every six month checkup. Periodontal (gum) disease occurs when plaque or tartar buildup at the gum line irritates or inflames soft tissue leading to gum discoloration and bleeding. While the signs of early periodontal disease, gingivitis, are subtle, left untreated, gingivitis develops into advanced gum disease, periodontitis. Patients with periodontitis begin to notice a number of more severe oral health concerns including receding gums, a bite that feels uneven or does not fit together well, and even tooth loss. Our skilled dentists offer a number of treatment options to help patients suffering from periodontal disease to restore their oral health. For those patients with mild gingivitis, we will likely recommend more frequent professional teeth cleanings in order to reverse the damage and keep smiles healthy. For more advanced cases, we typically recommend scaling and root planing. Scaling is the systematic removal of plaque and tartar below the gum line, and root planing is the smoothing of tooth roots in order to prevent future buildup. We understand that millions of US adults suffer from dental fear or anxiety, and while we take time to put patients at ease from the moment they arrive at our practice, we know that there are some who need extra help relaxing. For anxious patients, those who have sensitive teeth, gums, or gag reflex, and those who need multiple procedures completed in a single visit, sedation dentistry may be the best solution. We offer two forms of dental sedation: nitrous oxide and oral conscious. Nitrous oxide is the mildest form of sedation, but it offers a number of benefits. Breathed in through the nose during treatment, nitrous oxide takes effect quickly relaxing patients, and because it’s administered in our practice, patients’ vitals are monitored throughout care for optimal safety. Additionally, we are able to adjust dosage for patient comfort throughout care. When the procedure is completed, patients are able to return to their daily activities right away since the sedative effects of nitrous oxide wear off quickly. For those patients with more severe dental anxiety, oral conscious sedation may be a better option. Patients take a prescription sedative pill at a predetermined time prior to treatment. This sedation is long lasting which means patients should have a trusted friend or family member drive them to and from our office and monitor their recovery for the first 24 hours. While TMJ dysfunction and bruxism can stem from different causes, they may both benefit from treatment using a custom crafted oral appliance from our practice. These appliances sometimes referred to as nightguards offer relief from the painful strain of jaw joints that precedes TMJ dysfunction by allowing the jaw to rest comfortably in the ideal position throughout the night. Many patients unconsciously damage their TMJ by overusing them at night. Nightguards prevent this unconscious strain. Many patients who suffer from TMJ dysfunction notice significant pain relief after just a few nights wearing their nightguard. Patients who grind and clench their teeth may also benefit from this repositioning of the jaw. Much of the time, patients with bruxism are grinding and clenching their teeth because they are unable to comfortably position their jaws. Additionally, nightguards also place a physical barrier between teeth protecting them from potential wear. One of the most important advances in dental technology was the introduction of digital radiography (x-rays). These higher definition images have dramatically improved dentists’ ability to diagnose and treat oral health concerns in the earliest stages. Unlike traditional x-rays, digital x-rays expose patients to significantly less radiation, are faster and more comfortable to capture, and can be easily stored and transferred electronically for optimal convenience. Digital x-rays can easily be recalled from year to year to compare with previous x-rays in order to note areas of frequent decay or damage and make diagnosis and treatment planning more accurate and effective allowing patients to maintain the optimal level or oral health. We are also able to quickly and easily share these files with the patient, insurance providers, and specialists as needed. While many patients may not notice the difference between traditional and digital x-rays, digital photography has had a significantly more profound impact on our patients’ overall treatment experiences. Intraoral images of patients’ teeth, gums, dental restorations, and areas of decay or damage allow patients to fully understand their oral health and areas for concern because they see their smiles from the dentists’ eye view. We are dedicated to making patients partners in their dental care, and intraoral photography has transformed the way we work with them to develop a treatment plan that meets their unique oral health needs and smile goals. While digital radiography has allowed us to detect signs of decay and other oral health concerns in earlier stages, but DIAGNOdent allows our team to go one step further exposing areas where tooth enamel is weakened and may be susceptible to decay. The laser assisted cavity detection system allows us to measure the density of individual teeth to find areas where decay is in its very earliest stages in even the most difficult to access parts of patients’ smiles. The process is completely painless and comfortable for the patient, and by using DIAGNOdent as part of regular checkups, we’re often able to prevent tooth decay from ever occurring using topical fluoride treatments and helping patients make adjustments to their at-home hygiene routines.